The percentage of organizations with relatively mature risk management processes increased over recent years, although the majority of organizations still do not believe their processes reflect a “complete” or robust ERM process. 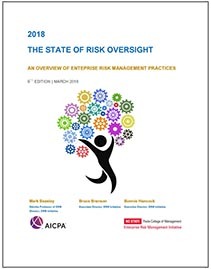 While progress is being made, there is still room for significant improvement in risk oversight for many organizations, according to our recently released study, 2018 The State of Risk Oversight: An Overview of Enterprise Risk Management Practices. NC State’s ERM Initiative, in partnership with the American Institute of CPAs, has just released its 2018 The State of Risk Oversight: An Overview of Enterprise Risk Management Practices. Based on survey responses from 474 business executives spanning a number of industries, types and sizes of organizations, the report provides detailed insights about the state of maturity of their organization’s current enterprise risk management (ERM) practices. This is the ninth year that we have conducted similar research in partnership with the AICPA. Managing risks in today’s environment isn’t getting easier. Two-thirds (65%) of organizations indicate they have recently experienced an operational surprise due to a risk they did not adequately anticipate. Risk management practices in most organizations remain relatively immature. Thirty-one percent of organizations (48% of the largest organizations) have complete ERM processes in place. Most boards of directors (68%) are putting pressure on senior executives to increase management involvement in risk oversight. Most struggle to integrate risk management with strategy. Only 29% of the organizations’ board of directors substantively discuss top risk exposures in a formal manner when they discuss the organization’s strategic plan. Forty-one percent (41%) of the respondents admit they are “not at all” or only “minimally” satisfied with the nature and extent of internal reporting of key risk indicators that might be useful for monitoring emerging risks by senior executives. This year’s report highlights many other specific findings about various aspects of an effective enterprise-wide risk management process. Calls for Increased Senior Management Involvement. 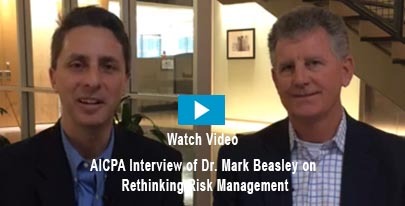 Be honest about the organization’s risk management capabilities. Find ways to connect risk management and strategic planning. Challenge the basis for identifying risk information reported to boards and others. Expand management dashboards to include risk indicators. Find ways to incentivize management to invest in risk management. Provide training and education on the value of robust, proactive risk management.